Ubuild gives you the freedom to do whatever you want, wherever you want, at any time. Created with the aim to simplify building construction and make the process more efficient, while offering users a greater freedom, both technically and financially. 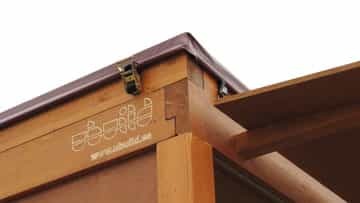 Ubuild combines the latest technology with the use of natural materials in order to streamline the construction process, making it more environmental-friendly and sustainable. 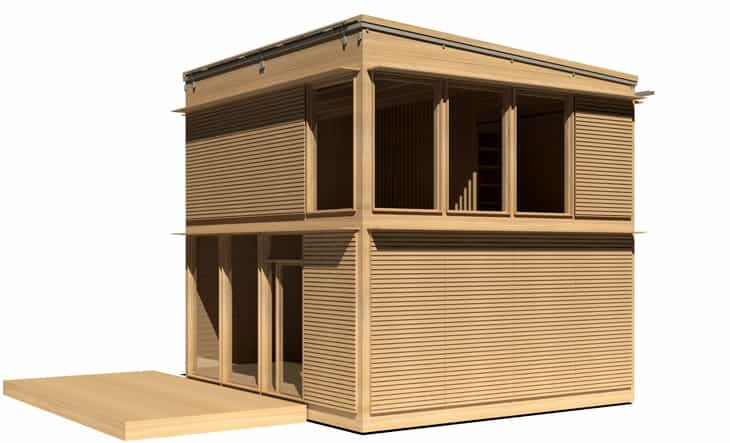 The Ubuild constructions are assembled from a structure of solid wood and very elaborate. 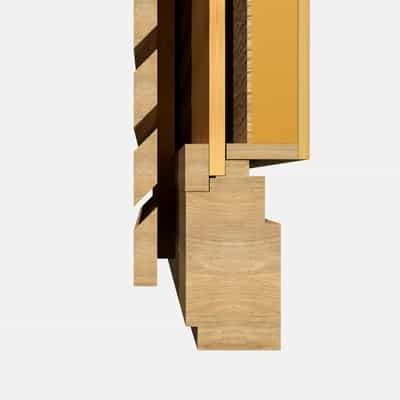 The structure has a modulation that facilitates the assembly and orders the interior spaces. The aesthetic arises from the constructive process itself. All the materials used are approved and of quality to guarantee the durability of the construction. 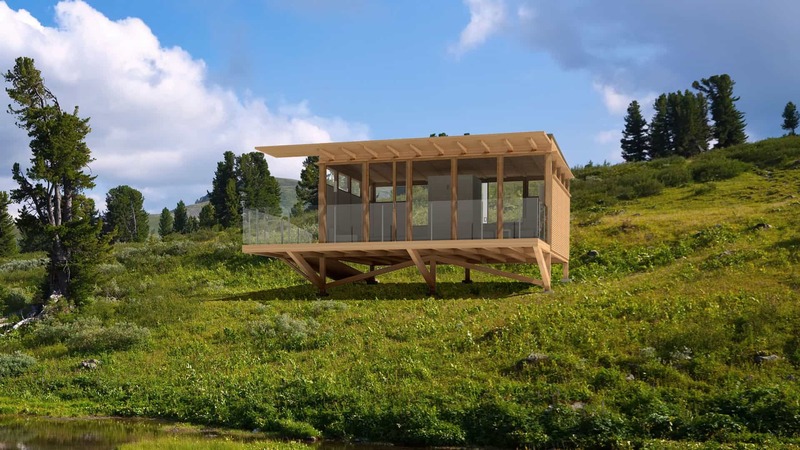 You can build anything, ranging from a weekend cabin or a high-quality main home, to anything you can imagine. You can expand an existing house, make a garage, a warehouse, a pergola...the only limit is your imagination! With regards to public space structures, you can build a bus stop, a temporary stand, a large warehouse, a school, a health center… there are no limits when it comes to building. 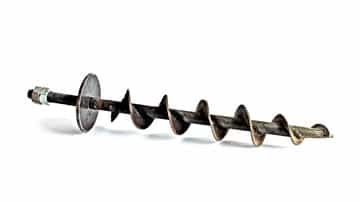 All the pieces and building elements are joined by snapping or bolting. This makes the building exceptionally versatile, as it is possible to relocate doors, windows, partitions, extend an area, or dismantle it as needed. 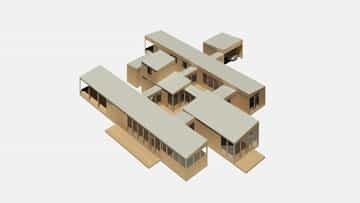 In the case of complex buildings, the support platform module comes in handy, as it facilitates field support, placement and maintenance, as well as any possible extensions to the original building. 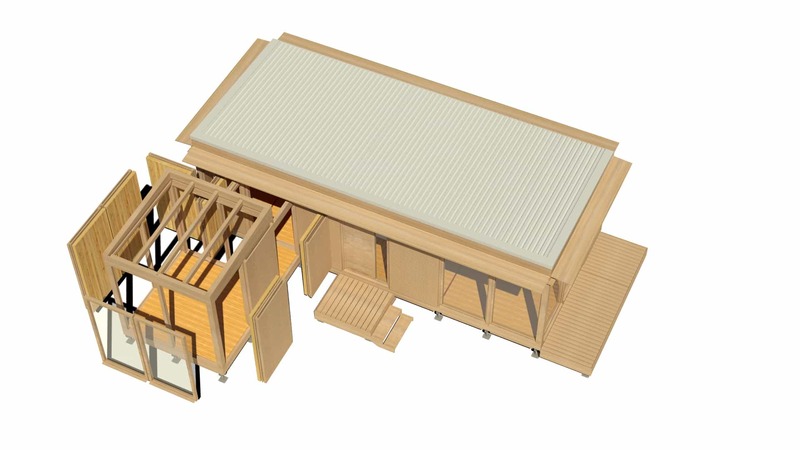 Ubuild constructions are mounted on a sturdy, solid-wood structure. This is achieved using the latest technology in wood processing, thus ensuring high-precision parts and allowing for a perfect fit. 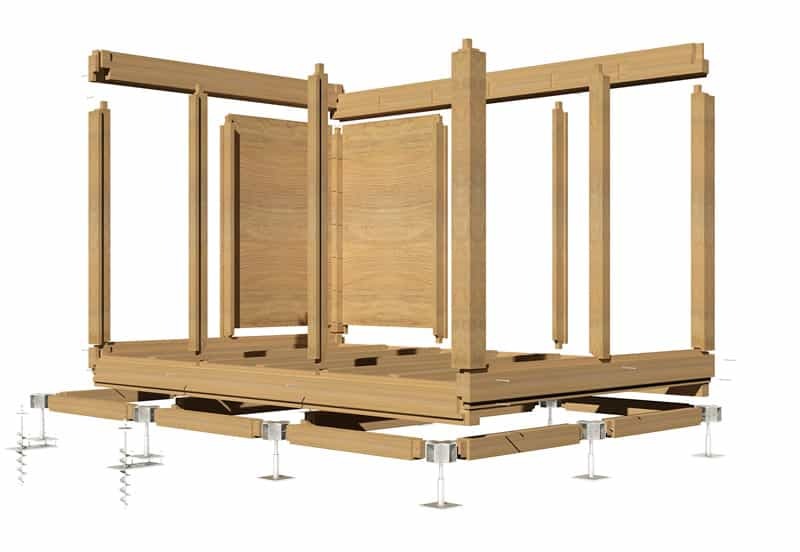 Even though the different parts of the structure have a very complex geometry, this makes the assembly task much easier. It is not necessary to be an expert in wood and steel-working techniques to perform the installation. 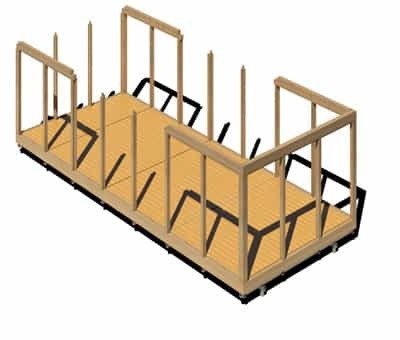 The whole process is streamlined, thus reducing production and assembly costs, and achieving a more cost-effective construction and higher quality in every aspect. Below is an example of the parts conforming the construction system, and how they relate to each other..
Light and easy to manage. You can choose the desired level of insulation and interior finishes. 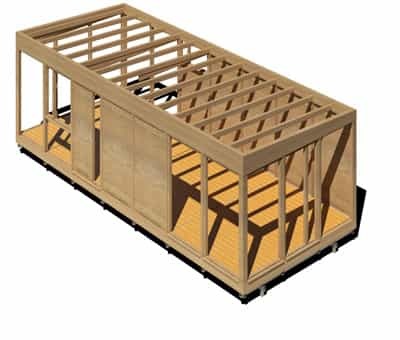 The whole structure is made of laminated spruce (strength class GL24). 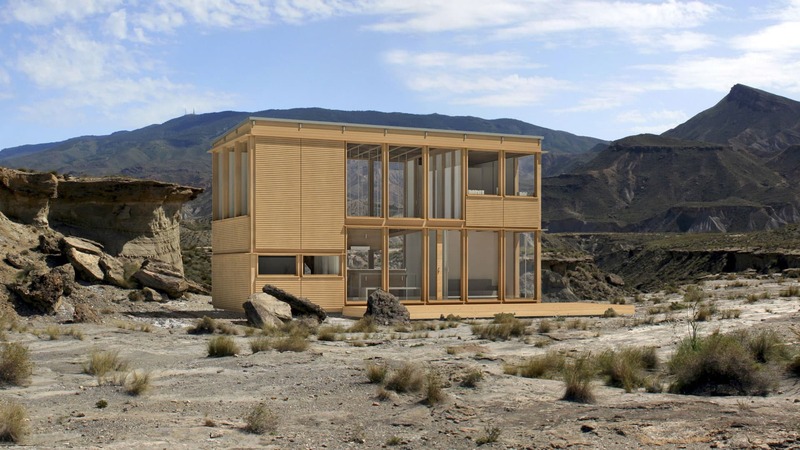 Made of film faced plywood, they protect the structure against sun and rain. Easy and safe structural assembly by snapping and bolting. It is fitted to the columns and beams and screwed into them. It helps thermally regulate the building according to the external conditions. 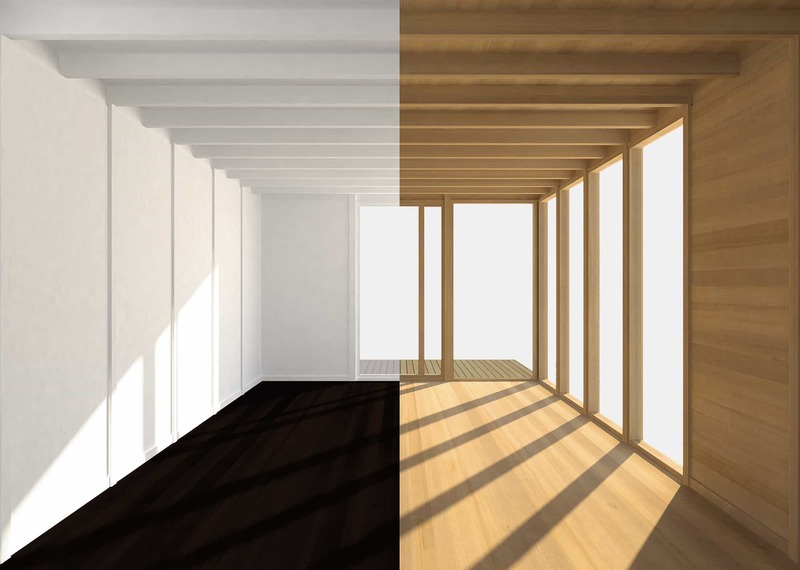 Phenolic birch plywood and wooden windows. Since all the elements are fitted together and bolted, you can modify the size and position of doors, windows, and external walls. It creates an internal air chamber. You can choose your finish material: phenolic plywood, OSB, DM, different colours, compositions and motives. 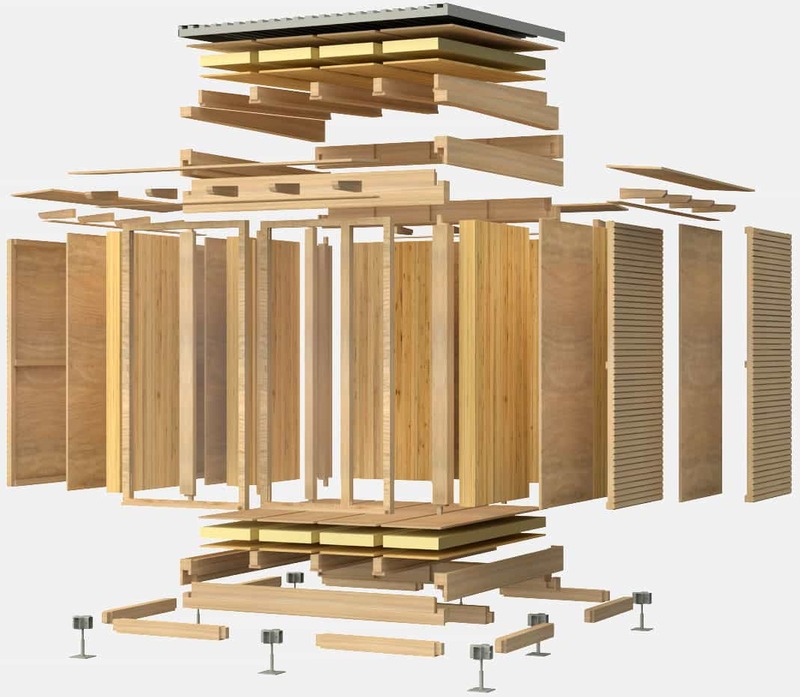 All the parts of the structure can be handled and assembled by two or three people without using cranes or special tools. 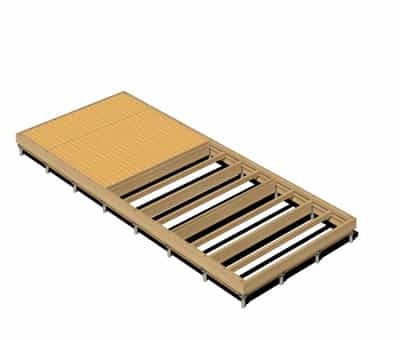 Lightweight and easy to handle, it is placed on top of the floor structure after a successful ground levelling. They are fitted and screwed into the floor beams to support the floor panel. 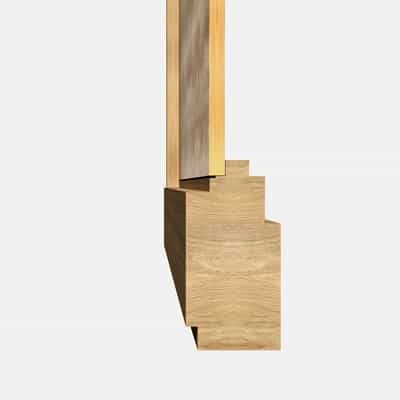 Beams and columns have been designed to fit the rest of the elements. 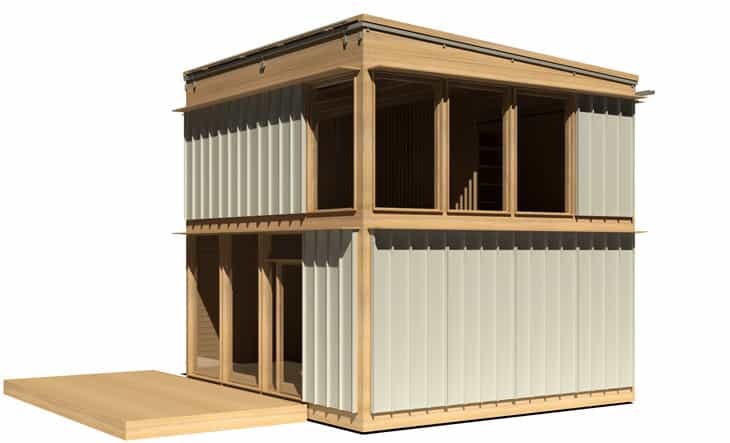 The Ubuild support platform is optional, allowing for easier support, ground adjustments, facility distribution, and assembly of future building extensions. The weight and size of the parts makes it possible for two people to quickly assemble or disassemble any construction, without any machinery or special tools. 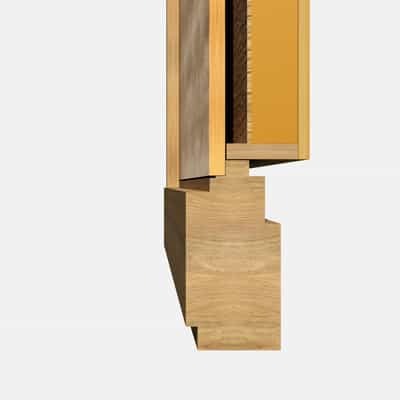 All the parts of the structure are designed to fit the other elements. It is not necessary to be an expert in wood-working techniques to perform the installation. 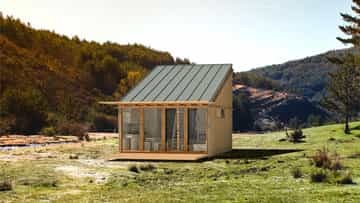 You can just start with a small building involving a relatively minor initial cost, and then extend it as you wish without damaging any material, and using what is already there. Both processes can be performed by the users themselves. You can relocate doors or windows, or extend them. You can assemble a balcony where there was none, and move it if not satisfied. Ubuild has for constructive configuration levels, in ascending order: basic, medium, high, and maximum. 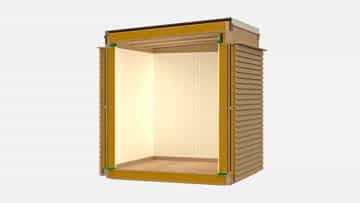 It is possible to start a building with a simple and inexpensive configuration, such as the basic one, and, where possible, move to a medium, high or maximum configuration, incorporating ventilated façade and roof. The external air chambers offered by the maximum configuration can be opened or closed in order to ventilate or isolate, respectively. Users can perform this change themselves. Floor, roof and facade modules are fitted into the beams and columns of the structure, creating several air chambers between them. The exterior air chambers can be opened or closed, so it keeps warm in the winter and cool in the summer. Auto-protect your home with Ubuild Protector. Protector completely closes your home, avoiding burglars, animals and dust when you are not there... Easy, effortless manual opening and closing. Only you will know how to go in. 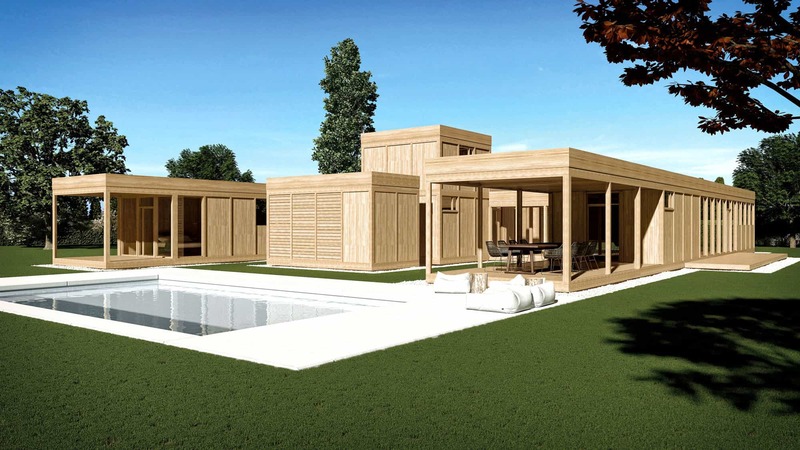 Wood house is health, prefabricated house is precisión, modular house is harmony, ecological house is integration, sustainable house is saving and future. 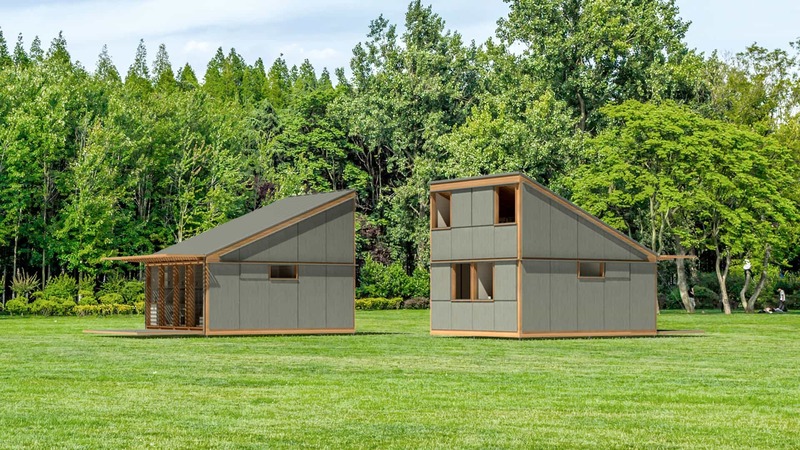 Ubuild collect this concepts and protect them for your peace of mind. You can choose and modify the interior and exterior finish of both the façade and roofing. 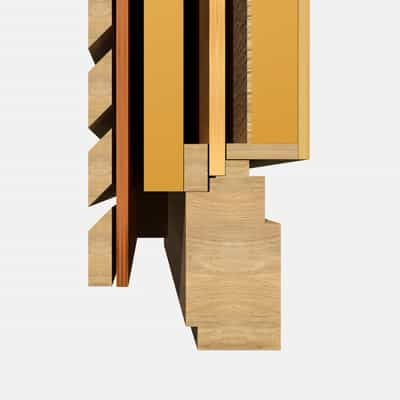 With regards to the ventilated façade you can choose among different materials, such as wood, stone, concrete, metal, ceramic… Regarding the interior spaces, you can choose from a wide array of materials, finishes, colours, and textures. There are no limits when it comes to building configuration. 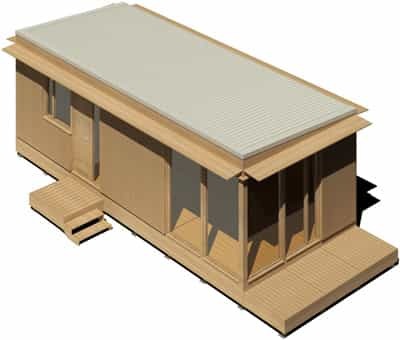 Ubuild uses wood, a natural and renewable product, as a basic building material. The use of wood and the scale and makeup of the building allows for a good integration into the natural environment where it is located. In addition, during the construction phase, the amount of debris produced is negligible. 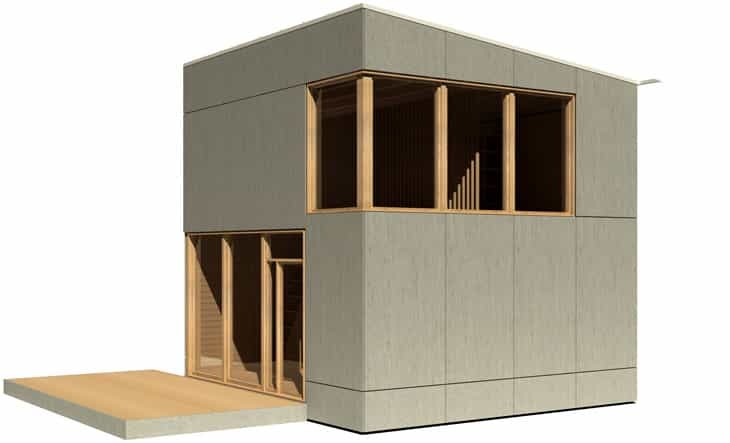 For spaces of environmental interest or temporary buildings, Ubuild has a shallow foundation that is supported and anchored directly to the ground, without requiring a concrete foundation. It can reduce the magnetic fields generated by electrical appliances, thus lowering your stress level. Wood is a very good sound insulator that can decrease reverberation time, increasing the quality of sleep of residents. It filters and purifies the air by minimizing the growth of bacteria and molds, which helps prevent allergic and respiratory diseases. Wood helps naturally regulate the temperature and humidity inside the building, easing rheumatic pains. Ubuild easily adapts to any new circumstances, at a lower cost. A building is no longer something rigid and expensive to change. 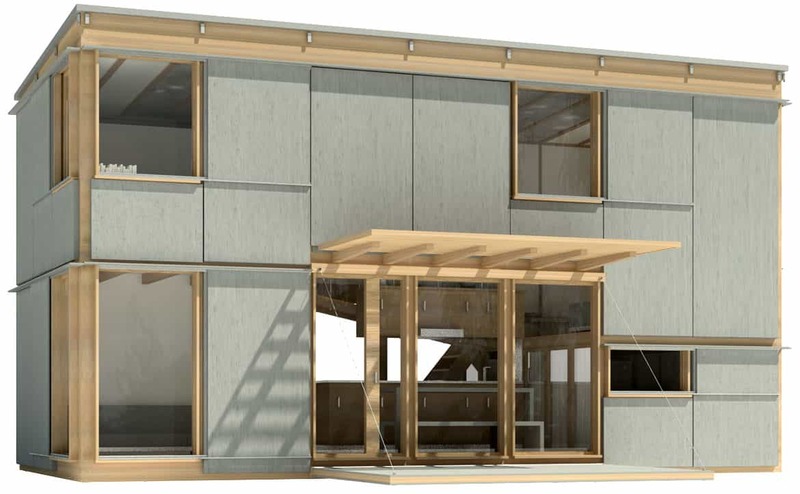 A Ubuild building is like a living organism, it adapts to new situations. 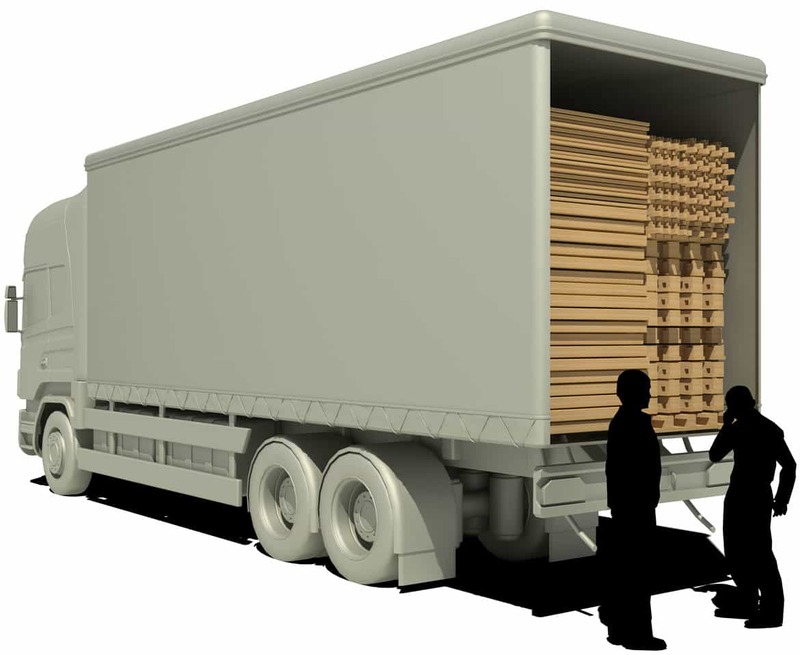 It can be stored in a confined space and then moved to where you are when you need it.